This paper explores new techniques to reduce the conducted EMI generated by switched power converters operating in multiconverter arrangement. These techniques are based in the combined application of interleaving and the modulation of some characteristics of the switching patterns. The effectiveness of such methods in terms of EMI reduction is theoreticaly developed and experimentally validated in a four channel parallel buck converter operating in closed loop. The technique that provides the best attenuation results is identified. Finally, undesired sideeffects produced by these techniques, such as an increase in the output voltage ripple, are evaluated. Mon, J. [et al.]. 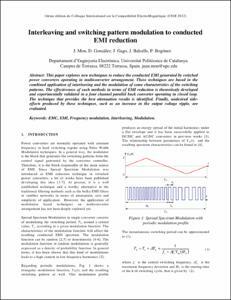 Interleaving and switching pattern modulation to conducted EMI reduction. A: Colloque International et Exposition sur la Compatibilité Electromagnétique. "CEM 2012 [Recurs electrònic ] : 16e Colloque International et Exposition sur la Compatibilité Electromagnétique, 25-27 avril 2012, Rouen". Rouen: 2012.